That's what my patient said to me on rounds the other day. It was late in the afternoon and visiting him was the last thing on my to-do list before heading out of Grady. He'd had some tests and I'd come back to check in on him and explain results. He'd need a minor procedure the following day and I wanted to be sure he was okay with it all. He was. After we'd gone through all of the business parts, I realized I had some time. Instead of walking out to chat with friends or my team, I pulled up the bedside chair and made up my mind to spend that window chatting with him. And honestly? Nothing about it was heavy. If anything, it was light. A woman was on the television talking about a myriad of unimportant things and repeatedly kept using the word “slay” to describe any and everything. Her outfit. Her friend's hair. Michelle Obama's entire time in the White House. And even the person interviewing her. It was “slay”this and “slay” that. Yeah, man. So, really, we were talking about whether or not the word “slay” had been officially beat to death or not. Me with my arm leaning on the bed rail and him narrowing his eyes and tapping his chin to give this topic far more thought than both of us knew it deserved. See, it had been a bit of a rough week. And with all the sandpaper rubbing against my heart over those last few days, this mundane chat with my young (but sick) patient was like a balm for my emotionally weary soul. Plus, I really liked this patient. His energy spoke to my own from the moment I first shook his hand on rounds a few days before. So, on this day in particular, I was really thankful to sit with him. “I blame Beyoncé,” I said. “Slay? Beat to death? Hmm. I don't think so. But it can't be the only thing you say, you know? Like, you have to mix it up. Everybody and everything can't slay.” Right when he said that, the lady said it again. We both laughed. “My niece asked me if I knew that wasn't really a thing people say any more. She legit said that to me.” That made me snort out loud because it was so funny to me. He laughed, too. Followed by another cough. After that the room fell silent again. The TV kept going and, other than my patient clearing his throat or coughing here and there, we weren't moving or talking. So there I sat. Chin in my palm and mostly just enjoying that moment. Which was good. A few more seconds passed and that's when he said it. Swung his head in my direction and rested his brown eyes on me. Even though I was facing the television, I could still tell he we was looking at me. “You okay, doc?” he said. “Who me?” I pointed at my chest. I turned my head away from the television and back toward him. I poked out my lip and furrowed my brow. I didn't say anything. Instead I just stared at him, surprised at how warm my face was becoming and embarrassed at how my eyes were stinging with tears. I didn't talk because I didn't want to start crying, you know? But really, he was right. Something was heavy on my soul. I wanted to tell him, too. I wanted to tell my patient, this patient who embodied every single thing I love about patient care and patient caring, all about what was weighing me down. I wanted to talk about it with someone less connected to it, someone who didn't really know me. This way I could just hear the words or see the expressions in response unfiltered. Or, just maybe, I could wrinkle my nose like a little child and cry into balled up fists without any expectations or pressure. Empathy uncut. But I didn't when he asked. I was his doctor. Though my sitting in his room that afternoon dissecting the social relevance of slang terms didn't exactly fall into the physician playbook I'd been shown in medical school or residency, I knew for sure that flipping the script in this way wasn't even in the same library. So when he asked, I just stayed silent. Just about 24 hours before that moment in his room, I was down in the emergency department seeing newly admitted patients with my team. My phone had buzzed twice in my pocket with text messages followed by two or three sustained vibrations from incoming calls. A few seconds later, I felt it happen again and that time, I fished into my white coat to see who it was. That was what the text read. It was from my colleague Danielle J. in reference to our friend and colleague Alanna. I walked straight out of that patient room and called immediately. That's when I learned that Alanna, who'd been fighting a ruthless cancer, was now intubated and in intensive care. The wind was knocked so hard out of my chest that I had to get out of the ER and away from my team immediately to catch my breath. This wasn't supposed to be happening. As soon as I got out of there I felt the tears filling up my eyes. Once they began falling, I abruptly stopped. Then I turned my forehead into the nearest wall and let myself cry. And I could feel the people looking at me as they walked by, their feet slowing down and wondering what could be going on with this doctor and the muffled, guttural sounds she was making. No one said anything though. They, too, must have read the doctor-patient playbook and decided not ask. Maybe my actions spoke enough. I mean, whatever it was had to be awful. A doctor facing a wall with shoulders shaking and body heaving in a stiff white coat said plenty. I guess it did. I met this remarkable woman named Alanna in July of 2007. I met her on her very first day of medical school when she came and sat in a room with several other medical students. And then, I really, truly met her when that big group was whittled down to just seven individuals, the seven that would go on to become my first small group. I would get to watch her evolve into a doctor, literally bookending the experience from that very first day with placing a doctoral hood over her shoulders at commencement on her very last. I jumped for joy with her on residency match day and again jumped for joy when, after her residency training, she took a job back at Grady Memorial Hospital and Emory where we first met. This time, though, it would be different. Now we would be colleagues, both of us Grady doctor attendings. One year into coming back to Grady, she was diagnosed with breast cancer. It was aggressive, but they caught it early. And that Alanna. That tough girl slugged it out. She came to work and taught the residents and rallied on. Finally that final treatment day came and our whole division celebrated by wearing pink in honor of Alanna and every person affected by breast cancer. It was super awesome. Things seemed to be getting back to normal. 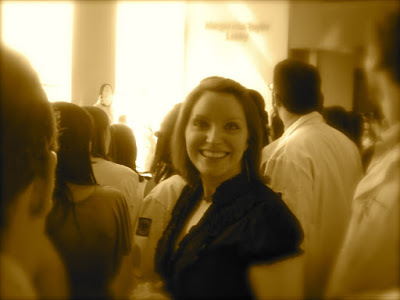 Alanna was getting on great as a Grady doctor and showing everyone the very things I got to see as early as July 2007. The accolades poured in and so did the opportunities. And she was over the moon. She was. Last April she wasn't feeling good. I remember sitting outside having lunch with her between lectures at a medical conference we were both attending in Washington D.C. “I'm feeling a little under the weather,” she said. And that was about it. A week later, she would find out why. Acute leukemia. Yes, after licking breast cancer, she now had a new cross to bear. “Are they sure?” I asked her. “I'm so sorry.” My voice was a whisper. “That's great,” I told her. “So great.” And then, like usual, I started crying. Crying these complicated tears about how much I hated knowing that her dreams were having these horrific speed breakers thrown before them. I'd think about her adoring husband and their precious son with his head of blonde curls. I could hear her telling me that she wanted more children and how she'd chuckle and refer to the timing of her breast cancer as “super annoying.” All of that would make me cry when trying to talk to her. I guess it was because of the nature of how our relationship began. As her formal small group advisor, even when she joined the faculty, my role always felt more familial, maternal-ish and big-sisterly than anything else. And in that role I'd always prided myself in protecting my students. From any and everything I could. Yeah, so not being able to do that made me cry. She was super kind with my crying. Patient and super kind like she was with everyone. Because of that, even though we talked sometimes, mostly, we texted. And I'm grateful to this day that she permitted me to do that. So very grateful. Just a few hours after I got that call about her being in the intensive care unit, another call came in. It was Danielle. And as soon as I saw the phone ringing, I knew. “She's gone.” That's all Danielle could eke out. I slumped to my kitchen floor and dropped the phone. And then we both erupted into tears. And the same thing happened a few more times that same evening. I was on the hospital service when all of this happened. And, since I'd spent the entire night crying in the fetal position on my bed, I knew that next day would be hard. The faces of some people made me cry even more. Then the text messages from that first small group amplified how out of order this all was. This wasn't supposed to be happening. So all of this is what was going on that late afternoon when I came to sit with my patient. And he was right--all of this was weighing heavy on my soul. So heavy that I couldn't lift it. Even still, I wasn't forthcoming when my patient asked. I just stayed silent. Even though the heavy was palpable and suffocating to more than just me. I tried to take things back to where they were. Light, airy and easy. But it didn't work. That heaviness on my soul was now out of hiding and cloaking the room. It was about time for me to go anyway so I arose from my seat and told him so. “Okey dokey.” He held up a thumbs up. I returned the gesture. I stepped toward the door and stopped short to pump some hand sanitizer foam into my hand. Just as I grabbed the door, he spoke one more time. I forced a smile and nodded. I pulled the handle of the door and then stopped. But then something clicked in me like a light switch. I spun on my heel and faced his bed from the door. “Was she nice?” he asked. He was right. That thought made the corner of my mouth turn upward on one side. I thought of how someone had told me about how, even in her ICU bed, she checked on the well-being of the physicians involved in her care. She even graciously told them that she trusted and appreciated them--even in her last moments. We both chuckled at that and pretended to give a high five through the air since I was nearly out the door. And just that quick the heavy returned. Pressing upon the room once again and sliding around my chest like a boa constrictor. We stood there looking at each other. Me at the door, him in his bed. I slipped out of the door and let it quietly close behind me. And then I walked out of the unit as fast as I could. . .through the automatic doors, down the hall. . . and then into the quietest Grady stairwell I could find so that I could lean my head into a wall once more to cry and cry. Crying because I would miss seeing the life of this beautiful woman continuing to unfold. Crying because thirty four is too young to die. Crying because a little boy had lost his mother and a husband had lost his wife. Crying because one of the most legit epic students-turned-doctors that I have ever witnessed has had her career cut short and that patients like the one I'd just left would never get to meet her. Crying because she slayed which was ironic because that's not a word she would have ever used to describe herself or anything else. But also crying because of that moment with that man and how Alanna herself understood more than anyone that patients take care of doctors, too. That patients save their doctors' lives every single day. I will miss Dr. Alanna Stone. Now playing on my mental iPod, one of my favorite songs of all time.